After an awkward beginning to the regatta yesterday, the RC44 World Championship Marina de Sotogrande fleet racing got underway, providing a reminder to helmsmen, tacticians and crew on all 11 yachts that this Andalusian venue lies just 25km from Gibraltar and the open Atlantic beyond. Racing today was held in stiff 20+ knot winds that topped out at 27 knots, creating boat speeds of 20+ knots, plus a worthy test for crews. After race one, the fleet was ordered back to Sotogrande Marina when a giant grey cloud crossed the course, obscured the rock of Gibraltar, while emptying its contents upon the crews. Despite this, and substantial shifts from the westerly offshore wind, one crew managed stand-out consistency: Igor Lah's Team CEEREF which put in a 1-2-1 scoreline. 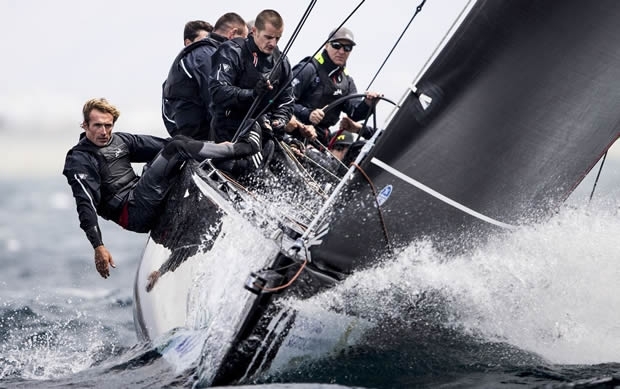 The Slovenian team features Britain's Adrian Stead as tactician, while Lah himself won the RC44 Sotogrande Cup when it last visited this giant residential development two years ago, as guest helmsman for Bronenosec Sailing Team. Lah explained: "Michele [Cannoni] did a great job preparing the boat and Adrian did a great job calling the right shifts. It was perfect, the guys did an excellent job on board, so it makes it very simple for me. Plus it always helps when some of the other big teams make a few little mistakes. It's a good start to the week." Adrian Stead observed that Team CEEREF, that also features Volvo Ocean Race and America's Cup winning main sheet trimmer Dirk de Ridder, has been "getting closer" over recent regattas. "Today is just day one out of four, but the goal was to keep chipping away. We knew it was going to be shifty. We knew that if you made a loss while someone else got it right, you just had to keep battling away: Race two we led at the gate, were fourth at the top mark and on the last run there were plenty of opportunities and we converted a fourth into a second. It's all about keeping your head above water and races alive." Stead continued: "Igor is doing a lovely job of sailing the boat very subtly in the gusts. We feel confident when the breeze is up, because we've got big Simone [Mina] grinding, which gives us plenty of power so Igor feels very confident to throw the boat around." Several top boats put in high scores today, notably Chris Bake's Team Aqua which suffered a broken starboard running backstay and two broaches in the lively conditions. Bowman Alberto Barovier fell off Vladimir Liubomirov's Bronenosec Sailing Team in race one and had to be recovered. The team finished 10th, but followed this up with a come-from-behind victory in race two to end the day fourth overall. Their Italian tactician wryly summed up the conditions: "This is a race course of headaches: One second you look famous, the next second you look stupid…"
Between Bronenosec and CEEREF, John Bassadone's host team, Peninsula Petroleum is tied with Vladimir Prosihkin's Team Nika. Bassadone summed up how he felt about day one of fleet racing: "It was good overall - a few mistakes, a few unforced errors, which is always a bit annoying, but generally pretty happy." The Gibraltarian skipper, who sails with a largely Spanish crew, admitted that he hasn't competed since the RC44 Virgin Gorda Cup in December... "and there are certain moments when you can tell… Overall performance and boat speed is good. Obviously it's pretty shifty, which caught us out of sequence in the second race, but we bounced back with probably our best performance in the third race where we clawed back a few places." They had a 2-6-2 scoreline today. Experience, reliability and performance to serve every boat around Europe.